The breathtaking 911 Turbo S that Porsche built almost entirely from its own spare parts catalogue has just sold for over $3 million. Built to highlight the ridiculous breadth of spares Porsche carries for the 993-era 911, it created unprecedented demand with wealthy bidders – and it’s not even road-legal. The outrageous final bid will benefit the Ferry Porsche Foundation, a new charity that aims to help young German people affected by social or financial hardship. 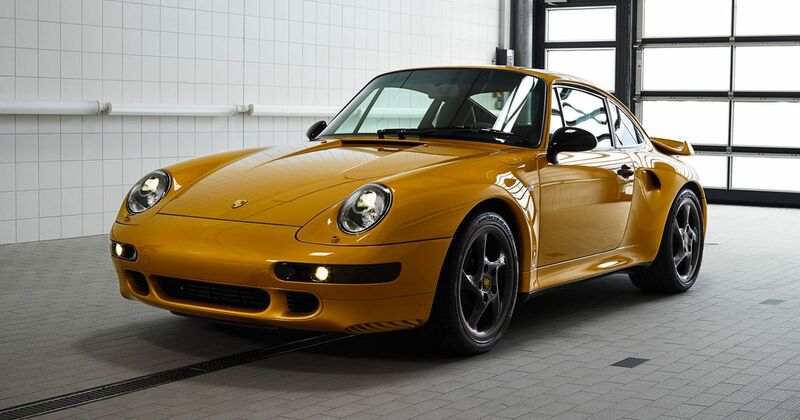 The car, dubbed Project Gold, was based on a spare 993 Turbo S body that Porsche presumably found in a back room somewhere. The twin-turbo 3.6-litre flat-six is the same air-cooled design as the original, boasting an identical 444bhp. Amazingly, the manual gearbox and permanent all-wheel drive system for the car were among the parts lifted directly from the spares brochure available through the Porsche network. By jumping through the correct legal hoops Porsche was able to register the car as a brand new vehicle with a VIN that consecutively follows the final 1998-built version, albeit this time without road certification. Only 345 993 Turbo Ss were built between 1995 and 1998. Project Gold features the Turbo S side vents on its body but matches its interior accents and Golden Yellow Metallic paint to the 2018 911 Turbo S Exclusive, of which 500 were made. The 993 was the first 911 to use ellipsoidal headlights instead of circular ones. It was also the first to use an aluminium chassis and the first to pack a pair of turbos. Demand and values in recent years have been climbing quickly. A tidy original 993 Turbo S can fetch over £250,000.